Custom Opoly: Trivia Quest! You should know this.. You live here! Trivia Quest! You should know this.. You live here! 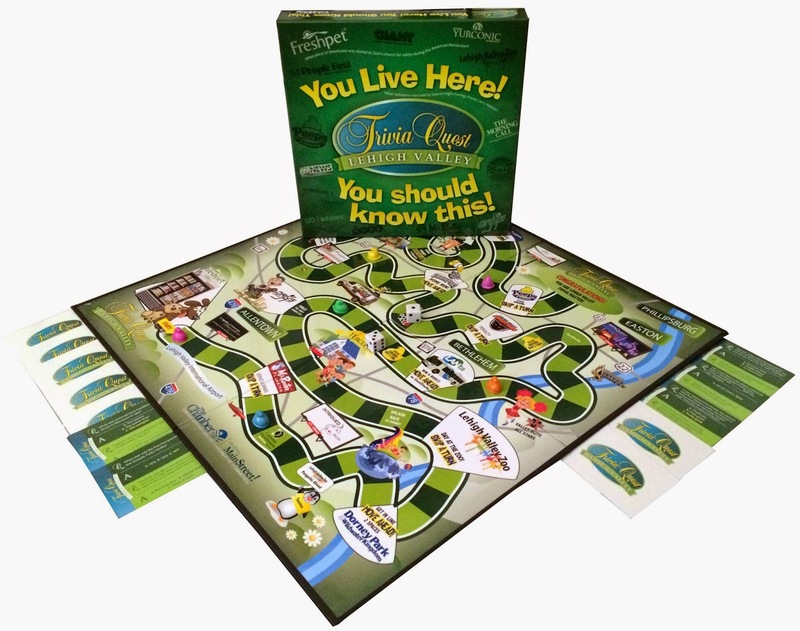 Custom trivia games are a great edition to your collection of "Town Themed" games! "Think you have what it takes to be named "Lehigh Valley Trivia Master"? To win you'll have to grab your PEEPS® and play your way around The Valley by answering hundreds of trivia questions based on the history, culture, sports, people, and more of the Lehigh Valley. It won't be easy but if "You Live Here...You Should Know This!" Proceeds support community projects throughout the Lehigh Valley (Benefits The Greater Lehigh Valley Chamber of Commerce). Over $30 In COUPONS AND OFFERS ENCLOSED. Plus $100 credit on your electric bill from Constellation Energy." We can create any custom board game you can think up! Visit our site here, for more details and information. 521 Promo has been in the business for over 10 years making game designers and enthusiasts alike dreams come alive one game at a time. We offer prototype services along with min. orders as low as 1 game and have the capability to manufacture 30,000 +. No job is too big or too small for us. Stop by and give us a call or send an e-mail with any questions you may have. Let's get started on creating your game today! Think you have what it takes to be named "Lehigh Valley Trivia Master"? To win you'll have to grab your PEEPS® and play your way around The Valley by answering hundreds of trivia questions based on the history, culture, sports, people, and more of the Lehigh Valley. It won't be easy but if "You Live Here...You Should Know This!" Proceeds support community projects throughout the Lehigh Valley (Benefits The Greater Lehigh Valley Chamber of Commerce). Over $30 In COUPONS AND OFFERS ENCLOSED. Plus $100 credit on your electric bill from Constellation Energy. Custom Board Games For Employee Training!